In signal processing, it is customary to use as the Laplace transform variable for continuous-time analysis, and as the -transform variable for discrete-time analysis. 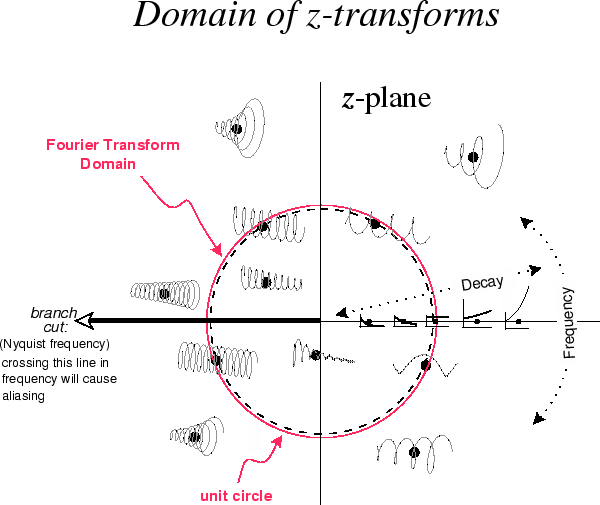 In other words, for continuous-time systems, the frequency domain is the “ plane”, while for discrete-time systems, the frequency domain is the “ plane.” However, both are simply complex planes. Figure 5.10:Generalized complex sinusoidsrepresented by points in the plane. Figure 5.11:Generalized complex sinusoids represented by points in the plane. Figure 5.10 illustrates the various sinusoids represented by points in the plane. The frequency axis is , called the “ axis,” and points along it correspond to complex sinusoids, with dc at ( ). The upper-half plane corresponds to positive frequencies (counterclockwise circular or corkscrew motion) while the lower-half plane corresponds to negative frequencies (clockwise motion). In the left-half plane we have decaying (stable) exponential envelopes, while in the right-half plane we have growing (unstable) exponential envelopes. Along the real axis ( ), we have pure exponentials. Every point in the plane can be said to correspond to some generalized complex sinusoids, with special cases being complex sinusoids , exponentials , and the constant function (dc). Figure 5.11 shows examples of various sinusoids represented by points in the plane. The frequency axis is the “unit circle” , and points along it correspond to sampledcomplex sinusoids, with dc at ( ). As in the plane, the upper-half plane corresponds to positive frequencies while the lower-half plane corresponds to negative frequencies. Inside the unit circle, we have decaying (stable) exponential envelopes, while outside the unit circle, we have growing (unstable) exponential envelopes. Along the positive real axis ( ), we have pure exponentials, but along the negative real axis ( ), we have exponentially enveloped sampled sinusoids at frequency (exponentially enveloped alternating sequences). The negative real axis in the plane is normally a place where all signal transforms should be zero, and all system responses should be highly attenuated, since there should never be any energy at exactly half the sampling rate (where amplitude and phase are ambiguously linked). Every point in the plane can be said to correspond to some sampled generalized complex sinusoids , with special cases being sampled complex sinusoids , exponentials , and the constant function (dc). In summary, the exponentially enveloped (“generalized”) complex sinusoid is the fundamental signal upon which other signals are “projected” in order to compute a Laplace transform in the continuous-time case, or a transform in the discrete-time case. As a special case, if the exponential envelope is eliminated (set to ), leaving only a complex sinusoid, then the projection reduces to the Fourier transform in the continuous-time case, and either the DFT (finite length) or DTFT (infinite length) in the discrete-time case. 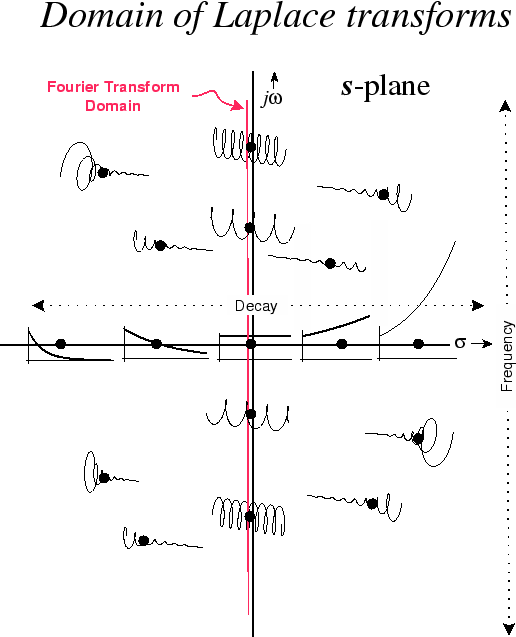 Finally, there are still other variations, such as short-time Fourier transforms (STFT) and wavelet transforms, which utilize further modifications such as projecting onto windowed complex sinusoids. Music 420delves into these topics.